Wonderla located in Bidadi the best way to enjoy your vacation is spending a fun filled day at a good amusement park. 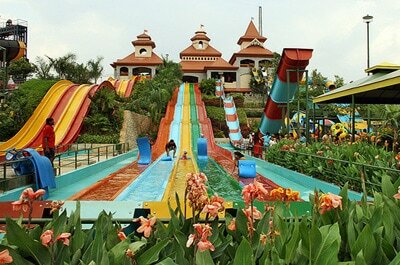 One of the best amusement parks in Bangalore is the Wonder La Holidays PVT LTD. It is located at Bidadi and is a great way to beat the summer stress. The company operates two of the largest amusement parks in Bangalore and Kochi under the brand name Wonderla. The amusement park is spread over 82 acres of land and has about 54 thrill packed rides, some which are suitable for kids and some which are great for adults. The park has been operational since 2005 and has up til now hosted over 5 million satisfied visitors. For Wonderla Bangalore address, scroll up at the listing above. The amusement park has many facilities for the convenience of the visitors. There are over 2350 lockers and restrooms and showers. One can change into clean clothes once they have enjoyed all the rides. One can also keep their baggage’s here though it is advisable not to keep any valuable behind. After all the fun it is quite obvious that one would feel very hungry and to satiate the visitors there 5 restaurants. There is also conference facilities that can handle upto 1000 people. Sri Radha Krishna Temple ( Kannada - ಶ್ರೀ ರಾಧಾ ಕೃಷ್ಣ ಮಂದಿರ ) has deities of Radha and Krishna located at Rajajinagar, in North Bangalore, Karnataka, India. It is one of the largest ISKCON temples in the world. 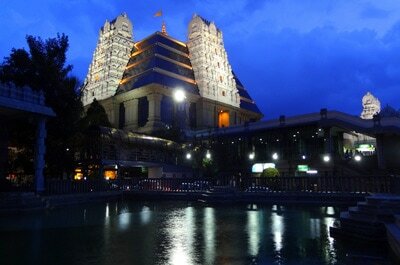 The temple is a huge cultural complex that was inaugurated in 1997 by Shankar Dayal Sharma. The project was conceived and executed by Madhu Pandit Dasa following the wishes of HDG A. C. Bhaktivedanta Swami Prabhupada, the Founder-Acarya of ISKCON to promote Vedic culture and spiritual learning.Hare Krishna Hill is the hillock on which this temple is situated. ISKCON Bangalore is a charitable society with the objective of propagating Krishna Consciousness all over the world, as explained by Srila Prabhupada, whose teachings are based on Bhagavad-gita and Srimad Bhagavatam. Centrally located in the CBD (Central Business District) of Bangalore on Vittal Mallya Road, UB City is just 1.5kms away from the MG Road – Brigade Road junction. With a total built up area of 16 lakh sqft., UB City is completed by the UB Tower, Kingfisher Plaza, Concorde, Canberra & Comet Blocks! Each of these blocks stand out for their distinctive look, while yet combining to produce the feeling of a city. 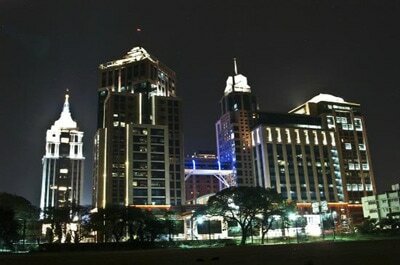 UB City also boasts of the largest Triple Level Puzzle Parking system that houses close to 1600 Cars. Another feather in UB City’s hat is, UB Tower – the tallest structure in Karnataka as on date, measuring up to a height of 123M, the tower houses the UB Group offices. Standing at 115M, Concorde Block is the second tallest structure within the UB City complex, followed by the Canberra Block which stands at 105M. Some of the biggest corporate names – 3M, Apple, Citibank, Ernst & Young, Kawasaki & Yahoo! sit out of these blocks. The biggest highlight of UB City, are the lower three levels of the Concorde and Canberra Block, which constitute the Retail area, christened The Collection. The title of India’s first luxury mall is aptly justified by brands like Rolex, Burberry, Louis Vuitton, & Canali. The Visvesvaraya Industrial and Technological Museum, (VITM), Bangalore, India, a constituent unit of the National Council of Science Museums (NCSM), Ministry of Culture, Government of India, was established in memory of Bharat Ratna Sir M Visvesvaraya. The building, with a built up area of 4,000 m2 (43,000 sq ft), was constructed in Cubbon Park. It houses various scientific experiments and engines, and was opened by the first Prime Minister of India, Pandit Jawaharlal Nehru, on 14 July 1962. The first gallery set up at VITM, on the theme of 'Electricity', was opened to the public on 27 July 1965.In order to honour Bharat Ratna Sir M Visvesvaraya, the All India Manufacturers’ Organisation, Mysore State Board, decided to set up a science and technology museum at Bangalore, and the foundation stone was laid by Shri B. D. Jatti, Chief Minister of Mysore, on 15 September 1958. 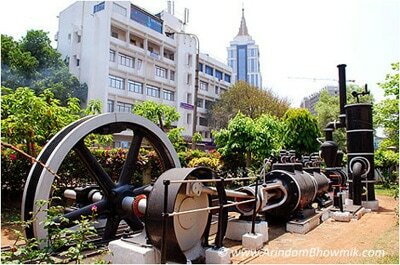 The Visvesvaraya Industrial Museum Society (VIMS) came to be registered as the nodal agency in order to pool resources from various industrial houses. A building with a display space of 4,000 m2 (43,000 sq ft), which was constructed in Cubbon Park, houses displays of industrial products and engines. it was opened by the first Prime Minister of India, Pandit Jawaharlal Nehru, on 14 July 1962. The Art of Living Foundation is a volunteer-based, humanitarian and educational non-governmental organizations (NGO). It was founded in 1981 by Ravi Shankar. 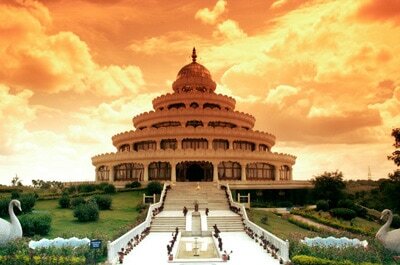 The Art of Living Foundation is spread over 156 countries. The Foundation is working in special consultative status with the United Nations Economic and Social Council (ECOSOC) of the United Nations. The International Association for Human Values is a partner NGO that Shankar founded, that focuses on the upliftment of human values at the grassroots level.Art of Living Foundation (AOL) has its international headquarters in Bangalore, India at Ved Vignan Mahavidyapeeth or VVM campus (usually referred to as the Art of Living's international facility in Bangalore, or as the Bangalore Ashram) and has regional centers in more than 150 countries. In Europe, the organization is known as the Association for Inner Growth. The Foundation was founded by Sri Sri Ravi Shankar, and offers a variety of personal-development and trauma-relief programs around the world.